The lux cassette of V. fischeri contains a left and a right promoter. The right promoter gives weak constitutive expression of downstream genes.This expression is up-regulated by the action of the LuxR activator protein complexed with the autoinducer, 3-oxo-hexanoyl-HSL. Two molecules of LuxR protein form a complex with two molecules of the signalling compound homoserine lactone (HSL). This complex binds to a palindromic site on the promoter, increasing the rate of transcription. This Plux promoter "pointing to the right" is the same sequence, but inverted, as part BBa_K199052. 3OC6HSL-LuxR is the wild-type pair of Plux. However, from this result, we can see that there are many other pairs can activate Plux. For example, 3OC6HSL-LasR, 3OC6HSL-RhlR, 3OC12HSL-LuxR, C4HSL-LuxR, C4HSL-LasR, C4HSL-Rhl can all activate it. What is more, the quorum sensing needs more than 30 hours to establish a steady state, which may be important for designing dynamic functions in bacteria with quorum sensing. With the hope to find an optimal promotor for our NEON system, we designed 9 mutations on sites -35, -36, -37 near the luxR binding site and tested another on -10 site that TUST 2017 reported to show decreased leakage. We conducted experiments to evaluate these lux pR mutants’ reaction to AHL stimulation and their leakage level. 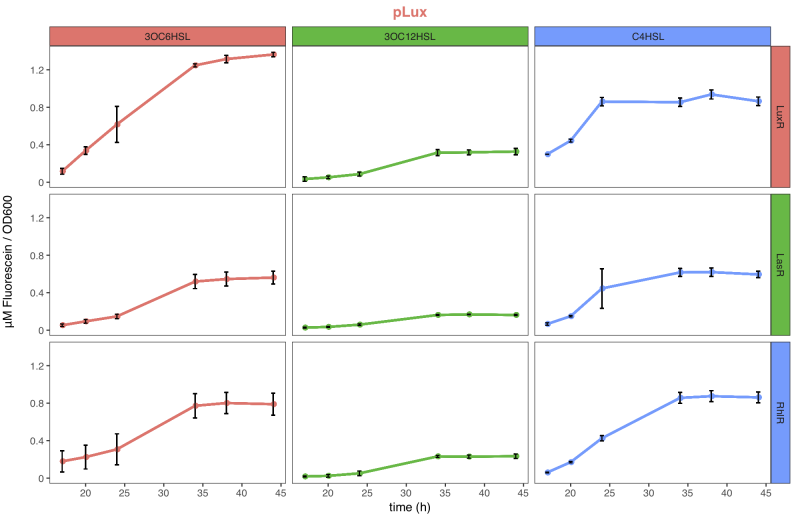 The test devices we designed include a constantly expressed luxR and a lux pR (or mutant) driven sfGFP (like BBa_K2558211 with original lux pR promotor, and BBa_K2558212 with lux pR-HS promotor). Figure.1. 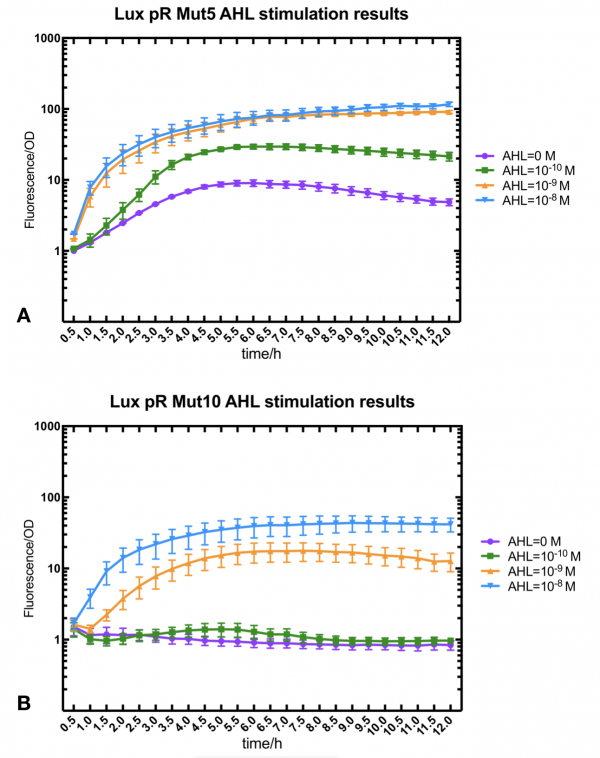 Leakage and 10^-10 mM AHL stimulation of lux pR promotor and its mutations. The fluorescence strengths and OD values are measured by microplate reader respectively at 510 nm and 600 nm wavelength. 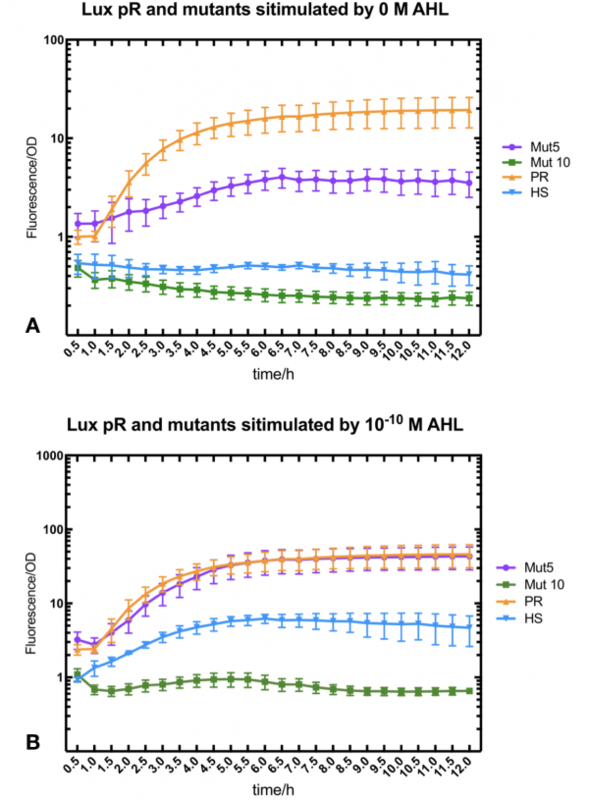 Plasmids with lux pR promotor and its mutants are transferred into E.coli DH5α. A The bacteria were treated without AHL inducing. High (Fluorescence/OD) ratio indicates strong leakage of promotor. Among all the strains, lux pR promotor has the strongest leakage and the largest error bar as well. B The bacteria were treated with 10-10 mM AHL induction. High (Fluorescence/OD) ratio indicates high expression intensity. 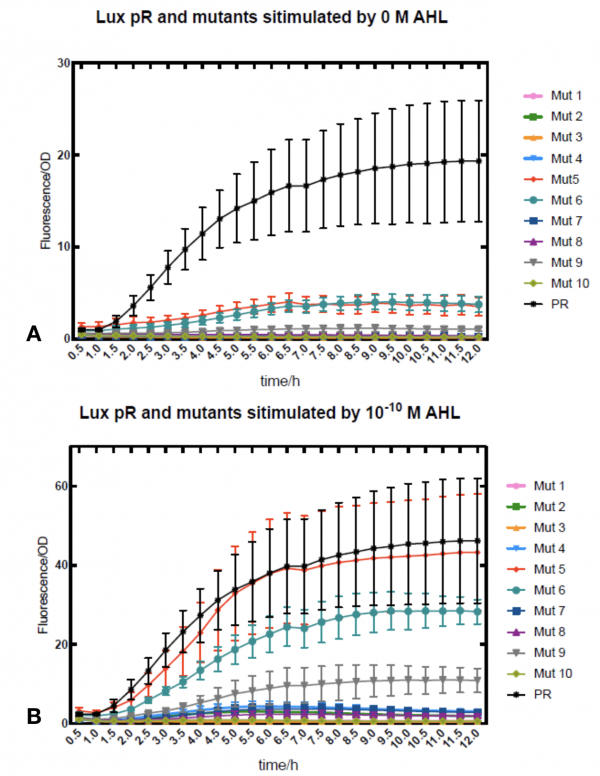 Mutation 5 has almost the same expression intensity as the wild type lux pR promotor. Figure.2. Leakage and AHL stimulation of of lux pR Mutant 5 and Mutant 10. The fluorescence strengths and OD values are measured by microplate reader respectively at 510 nm and 600 nm wavelength. A Plasmid with lux pR Mutant 5 is transferred into E.coli DH5α. The bacteria were treated without or with 10^-10 mM, 10^-9 mM and 10^-8 mM AHL inducing. B Plasmid with lux pR Mutant 10 is transferred into E.coli DH5α. The bacteria were treated without or with 10^-10 mM, 10^-9 mM and 10^-8 mM AHL inducing. Figure.3. Leakage and 10^-10 mM AHL stimulation of of lux pR promotor WT, Mutant 5, Mutant 10 and HS. The fluorescence strengths and OD values are measured by microplate reader respectively at 510 nm and 600 nm wavelength. Plasmids with lux pR promotor WT, Mutant 5 and Mutant 10 are transferred into E.coli DH5α. A The bacteria were treated without AHL inducing. High (Fluorescence/OD) ratio indicates strong leakage of promotor. B The bacteria were treated with 10^-10 mM AHL induction. High (Fluorescence/OD) ratio indicates high expression intensity. Table.1. 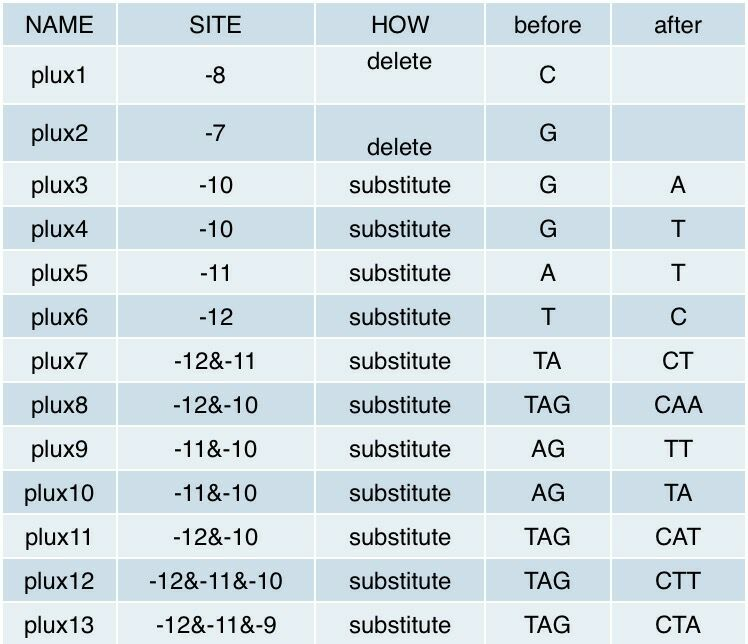 Results of lux pR mutation analysis. As for why some mutations on -35 to -37 sites would decrease the leakage of lux pR without severely influencing the expression level, we have some hypotheses and explanations. It is reported that -35 to -37 sites are last three bases of lux box which is upstream of the lux promotor and bound specifically by luxR, one of regulatory protein involved in lux expression system. 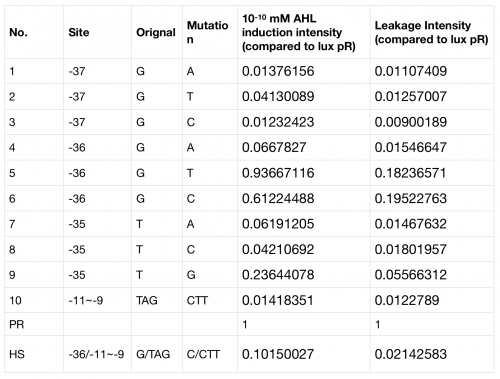 G-36T mutation has less influence than other mutation on sites -35 to -37, which is same to our result. Besides, G-36T is not involved in the two regions of nucleotides -52 to -50 and -39 to -37 which directly contacted with luxR protein. Therefore, this single substitution of nucleotide would decrease the leakage of lux promotor without influencing the expression level too much. two Pick a single colony by a sterile tip from each of the LB plates for all the experimental and control groups. Add the colony into 5ml LB medium with ampicillin at 100 ng/µl. Incubate for 6-8 h at 37℃ in a shaker. four Add 100 µl bacteria culture medium into a sterile 96-well plate. Add AHL to final concentrations of 0, 10^-10,10^-9,10^-8 M. Fresh LB medium serves as blank control. Positive control is colony constantly expressing sfGFP and negative control is colony without sfGFP expression. Place the 96-well plate into an automatic microplate reader. Incubate at 16℃ overnight and measure the fluorometric value at 510 nm and OD600 of each well every 30 minutes. Antunes, L. C., et al. "A mutational analysis defines Vibrio fischeri LuxR binding sites." Journal of Bacteriology 190.13(2008):4392-4397. Zeng, Weiqian, et al. "Rational design of an ultrasensitive quorum-sensing switch." Acs Synthetic Biology 6.8(2017). Documentation: In order to create our complete part collection of parts compatible with the Golden Gate assembly method, we made the part BBa_K2656003 which is this part adapted to the Golden Gate technology. >Internal Priming Screening Characterization of BBa_R0062: Has no possible internal priming sites between this BioBrick part and the VF2 or the VR primer.